2Checkout users encounter low sales due to the absence of strong business growing insights. But, with Putler; an in-depth reporting and analytics software, users can now surely take their business to new heights. Why in-depth reporting for 2Checkout is a must? The traditional 2Checkout reports provides only transactions data that is not enough to grow your business. To accelerate business growth, you must get acquainted with in-and out-of your business and hence, you must stick to in-depth reporting always. Metrics like revenue comparison, growth in sales as compared to previous period, hourly revenue breakup, times and days when you experience high/low sales, etc. are not reported in the 2Checkout reports. Sale velocity, month/week/day wise breakdown of sales, revenue and refunds for each SKU, revenue contribution from top 20% products, product leaderboard, and other product metrics are not covered up in 2Checkout reports. 2Checkout also misses out on customer insights like – new vs returning customers, customers list with top paying customers, their last transaction date and number of transactions, customer lifetime value, customer order history with day/week/month wise grouping of orders, refunds and net amounts, etc. Top search terms driving traffic to your sites, number of people using those search keywords, and their bounce rate, visitors categorisation – hot lead, lead from social media and organic search leads, number of sessions and other traffic related insights are also not available in 2CO reports. Is Putler The best 2Checkout reporting tool? 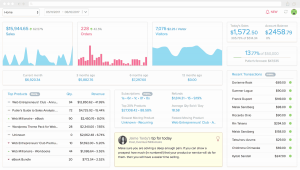 Putler is the perfect reporting and analytics solution for 2Checkout users. Connect your 2Checkout account to Putler and you will come across instantly useful insights and metrics to grow your business. Multiple accounts consolidation: Not just 2Checkout, you can accurately combine multiple ecommerce platforms, payment gateways and view your business stats for each one of them. Real-time data for multiple platforms: 2Checkout integrates with 100+ shopping carts like WooCommerce, Magento, Shopify etc. Connect your shopping carts and even payment gateways along with your 2Checkout accounts to Putler and have a complete view of your business – accurate and real-time, without worrying about data duplicates. Individual & aggregated data: You can connect any number of 2Checkout accounts to Putler and can view individual as well as combined stats if you are running multiple business. 153+ business metrics: All those important and widely useful metrics missing in 2Checkout reports are covered in Putler with some additional insights. Instant transactions search: Putler’s search feature works at a blazing speed. Enter a few search terms and all related transactions to your query will be brought up within seconds. 2Checkout reports are good if you just want to look at your transactions data. But, if you want a complete picture of your business and track it in real-time, Putler is your go-to solution anytime.